A popular waterhole visible from the main building. Scrumptious 3 course meals with friendly service. Game drives are offered in the conservancy. Re-built and refurbished in August 2015. Hobatere Lodge reopened in 2015. It's location, on a private reserve adjacent to Etosha makes this a very good option for the area. The wildlife is on a par with Etosha and as this is owned by the #Khoadi //Hoas Conservancy, your stay here directly benefits the local community and conservation efforts in the area. The lodge offers accommodation in chalets and also a new separate building, the facilities in both are the same. The rooms are simple but comfortable, bright and airy. Each room has an en-suite shower, toilet and washbasin. There is also a writing desk, bedside lamp, a small coffee and tea station and a deck in front of the unit. The spacious main area houses the restaurant, lounge and bar. Enjoy excellent meals in the restaurant, al-fresco on the veranda or experience a Namibian braai (bbq) out by the boma. The decor is earthy browns and terracottas and the wooden and leather furniture is complimented by the African fabrics and artefacts dotted around. The main area and veranda face onto a busy waterhole and there is a hide nearby. The lodge has an inviting outdoor the swimming pool and deck with sun loungers, and it's easy to spend a few lazy hours here. There is a small curio shop on site selling a selection of locallt made items. Add to this the warm welcome and attentive service and you have a wonderful place to stay and from here you can make trips into Etosha and explore the western side of the park. Activites offered here are extra, but include game drives, both day and night in the Hobatere conservancy along with guided walks. The night drives give the opportunity to see lesser spotted animals such as gennets, porcupines and honeybadgers. The guides are from the area and very knowledgeable and are sure to add value to your experience. 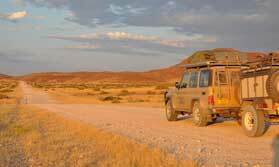 You can also take advantage of a full day guided trip into Etosha if you wish, or you can self-drive. Open: Hobatere Lodge is open all year round. Location: The lodge is located in a private conservancy adjacent to Etosha. Entry to the park is via the Galton Gate. Rooms: The rooms are simple but comfortable and have en-suite shower and flush toilet. There is a small coffee and tea station, and an outdoor seating area. Activities: The camp is owned by the #Khoadi //Hoas Conservancy and is managed by the same people that manage Grootberg Lodge and Fish River Lodge who have years of experience. Activities offered here are morning and afternoon drives through the conservancy which has similar game concentrations as Etosha. The experienced guides also lead nature walks. 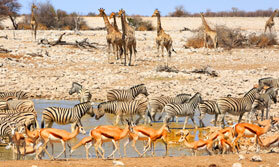 If you wish you can take advantage of a full day guided tour of Etosha. Facilities: There is a spacious main thatched building which overlooks a busy waterhole. This houses the dining area, the comfortable and cosy lounge and also the bar. Outside is a veranda, swimming pool and also a hide. Dining: Dining takes place both indoors and outdoors at separate tables. Dinner is a three course affair. You may also get the opportunity to enjoy a braai at the Boma. Children: Children are welcome at Hobatere Lodge.